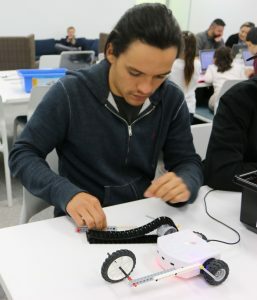 When one hears the words “technology workshop” one might imagine workstations, cutting edge technology and a group of people of similar skill levels and objectives coming together to learn more. 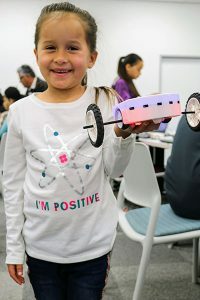 On Sunday, March 11th people from the Belle Haven neighborhood in Menlo Park attended a different kind of technology workshop. 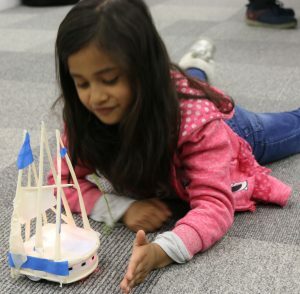 It was funded by the City of Menlo Park, organized by Sharon Marzouk, Belle Haven resident and founder of TechyKids and conducted on the Facebook campus. The workshop was open to anyone 6 – 103 years of age. Families attended the workshop together. 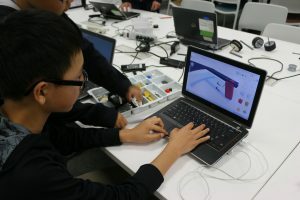 Everyone was provided with their own workstation and robot and was given a list of three project to choose from. They were given their own personal account and learning path on the TechyKids system. of the workshop, all groups had a project or deliverable that they proudly presented, showing off all that they learned that day. Unlike other project based learning settings, no two projects looked the same. 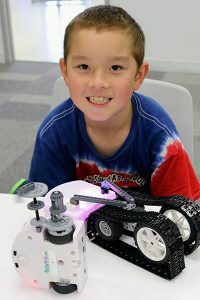 platform like TechyKids that provides both structure and flexibility this experience goes to show that a community that learns together grows together!